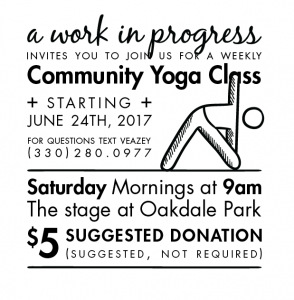 Come to Oakdale park Saturday mornings for a yoga flow with Veazey. ALL levels welcome, even first-timers, just let Veazey know it’s your first time and she’ll give you some tips on what to expect. Each week the practice will be different. Vinyasa yoga is usually the base of these yoga classes but some Kundalini or Yin yoga may very well be incorporated into the mix. We are working to raise money to go towards the opening of a studio so that we can have as many classes as we want to! Donations are encouraged but really not necessary if you aren’t able to contribute. Cards, cash, or checks will be accepted at the class so come a lil early or plan to stay a lil bit afterwards. Regardless if you donate or not, we’d like to get your name so that we know who attended the class. If you have any questions just contact us. Hope to see ya there!